The PSP-series have been especially designed for swimming pool, aquatic and aquaculture applications. Available from 3.5 to 10 HP. 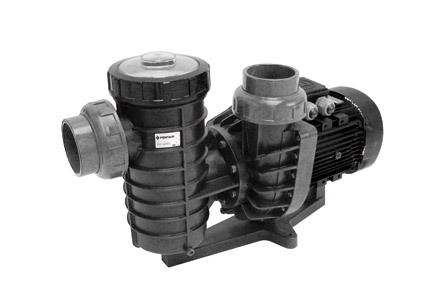 High performance commercial pumps are designed for maximum efficiency and quiet operation in every detail. 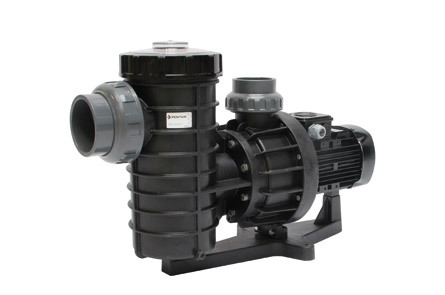 Especially designed for swimming pool, aquatic and aquaculture applications. Seawater approved up to 4% salt concentration. Available with or without large pre-filter. Injection molded components of high quality glass-reinforced thermoplastic. C E & TUV Approved, IP55 protected, IE2 compliant TEFC motor. Corrosion resistant, high grade stainless steel motor shaft. Included connections are metric slip fit 110mm ID inlet and 90mm ID - outlet for 3,5 to 5,5HP versions and 110mm ID outlet for 7,5 and 10HP versions. High chemical resistance with all metal internal components being stainless steel.